The BAP Acoustics Group is a specialist arm of the multidisciplinary BAP architectural practice. Acoustic consultancy has been an integral part of the practice’s work since its founding in 1962. The wide experience of the team embraces architectural acoustics, the sound insulation of buildings, the control of noise and vibration from building services and the control of noise in the wider environment. The practice is a founder member of the Association of Noise Consultants and is bound by their Code of Ethics. 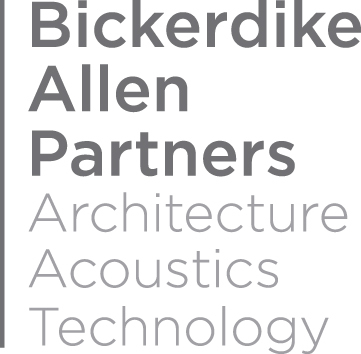 Bickerdike Allen Partners is an independent consultancy with no financial interests in acoustics products, manufacturing or fabrication activities. BAP offer consultancy services to a wide range of clients and we are able to tailor our services closely to meet individual needs. On larger projects, advice can be given during individual stages or a comprehensive service provided from project inception through to final commissioning.